As you know, I work with a limited number of one-on-one coaching clients each month. Many of them have been with me for years…including one who has now been a client for over 11 years. One of the most common requests they have is for me to review their website copy, emails, videos, etc. Test a new headline. Improve the offer. Cut out ‘speed bumps’ that slow down the copy. Sometimes even simple changes can make a dramatic difference in your sales and profits. This is true even for one of my current clients who is a world-class copywriter. He charges significantly more than I ever have for copywriting, plus royalties. Yet, he often asks me for feedback to get a second pair of eyes on what he creates. It’s amazing what you can spot when you read through copy as if you were one of the potential buyers. Would you like to know my most common copy suggestion to clients was this past week? I’ve said it or written it close to a dozen times this week. Move that testimonial higher on this opt-in page. A client did a whole bunch of tests of his opt-in page a few months ago, and the testimonial was one of the most important variables on the site. Moving a testimonial that best fit the Ideal Client Avatar just below the headline generated more new opt-ins than testing different headlines for him. 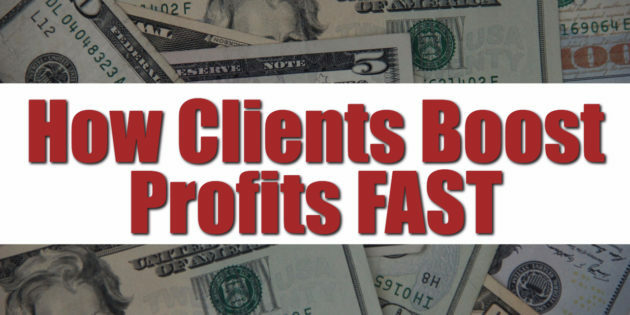 The past week I suggested a client add more proof screenshots and case studies to his webinar presentation. He already had several, but we wanted to create overwhelming proof that his methods work since he is selling a high-end service. While reviewing a video sales script, I suggested a client find quotes from recognized experts in his industry to back up several points he made. This was in addition to his own story and testimonials which were already included. We moved video testimonials earlier in another client’s sales video (just over 2 minutes into the presentation). One of the fastest ways to boost your sales and profits is to add more proof. If you’ve already added proof, try moving that proof earlier on the website or in your video. A lot of the popular copywriting formulas have proof mixed in around the middle or even later in long copy. That was great a few years ago, but your audience is even more jaded today. They’ve heard all the promises. They’re telling you to prove it or they’re out of there. Make a promise in your headline. Immediately back it up with proof. Whenever you make a promise in your copy, add proof that backs up that promise. There are dozens of ways to add proof including testimonials, case studies (your own and clients), video demonstrations, quotes, scientific studies, and more. Pull up one of your landing pages now. Is there proof on the page? Can you add more proof? Can you move the proof earlier on the page? This solution is so simple, but it’s so powerful. And while suggesting specific additional forms of proof was the most common suggestion this past week, it was only one of the ways I helped clients earn more, work less, and enjoy life. I’ll be taking a few new clients this upcoming Monday, September 4th. January was the last time I accepted any new clients, and it will at least be 2018 until any additional slots are available. Check out my proof on that page…including how I helped Dr. Glenn Livingston develop ‘super powers’. These coaching slots always go fast and I only contact people through the sublist available on that page.